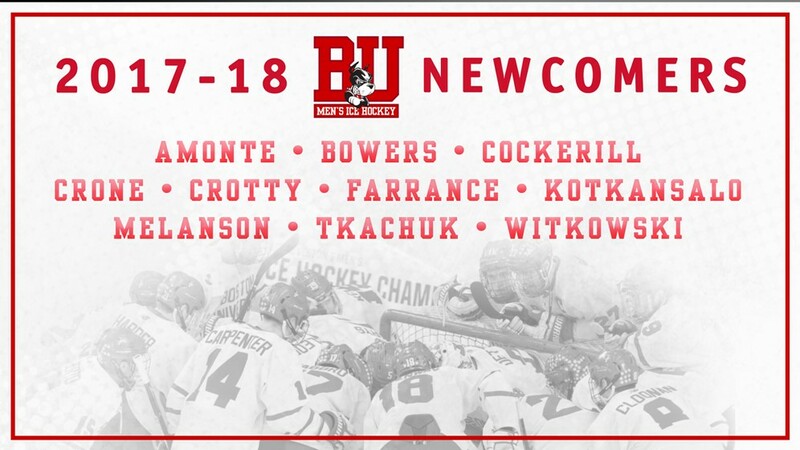 Terrier Head Coach David Quinn has announced a nine-man freshman class—for the second year in a row—along with a graduate transfer—for a total of 10 newcomers to the BU hockey program. Seven forwards and three defensemen join 17 returnees from the 2016-17 squad that reached the NCAA West Regional Final (2017-2018 roster). "One thing I really love about this class is the balance," said Quinn. "We've got maturity, we've got skill, we've got physicality, and to top it all off, I really love the character of all these guys. 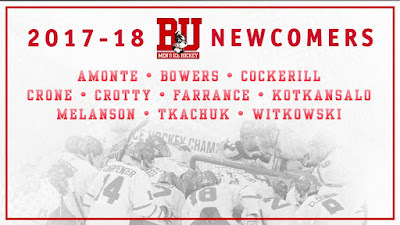 They have a great work ethic and they are definitely going make BU better both on and off the ice." ● Brady Tkachuk, a 6’2” power forward from the NTDP 18s who captained the U.S. to the World U18 championship and played in the recent World Junior Summer Showcase. 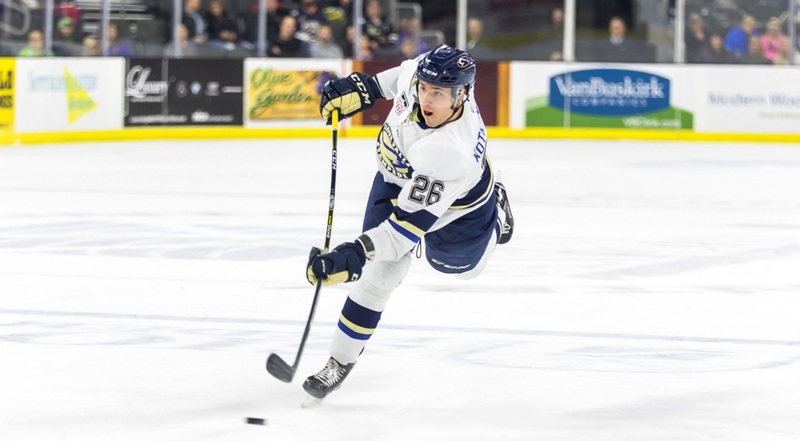 ● Shane Bowers, a 6’2” center from Halifax, N.S., who scored 51 points for USHL Waterloo last season and earned USHL All-Rookie honors the previous season. ● Hank Crone (photo), a 5’8” forward, whose 62 points for Fargo was third best in the USHL. Crone put up 103 points (41G, 62A) over the past two seasons. ● Graduate Transfer Drew Melanson, a 5’11” center who played three seasons at RPI, leading the Engineers in scoring as a freshman with 20 points. 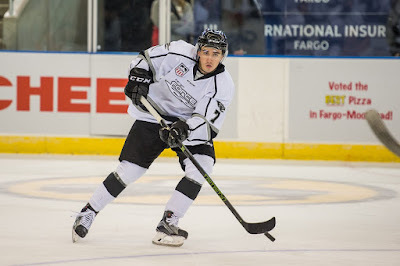 Previously played at Waterloo and Omaha in the USHL. 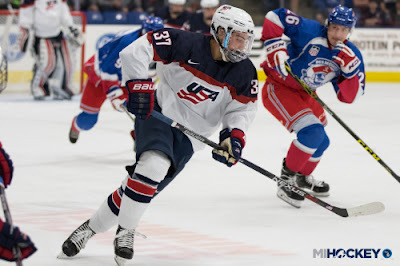 ● Logan Cockerill, a speedy 5’ 9” forward who scored 30 points for the NTDP U18s and also played in the World Junior Summer Showcase. 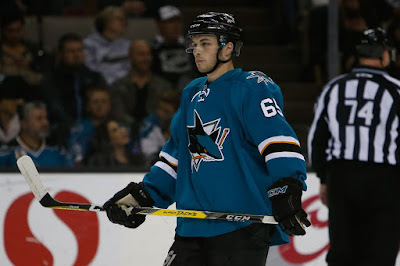 ● Ty Amonte, a 5’11” right wing who scored 37 points for BCHL Penticton following a four-year career at Thayer Academy where he totaled 110 points during his final two years. ● Jake Witkowski, a 5’ 10” right wing who scored 40 points each of the past two seasons: in 2016-17 with BCHL Alberni Valley and in 2015-16 at Avon Old Farms as a teammate of Patrick Harper. ● David Farrance, a 5’ 11”, left-shot puck-moving defenseman, who scored 37 points for the NTDP U18s and also played in the World Junior Summer Showcase. ● Kasper Kotkansalo (photo), a 6’ 2” left-shot defenseman from Finland, who played for USHL Sioux Falls last season and won gold for Finland in the 2016 World U18 Championships. ● Cameron Crotty, a 6’3” right-shot defenseman who scored 31 points in two seasons with the CCHL Brockville Braves and earned the league’s Top Prospect Award last season. ►Tkachuk and Amonte are the sons of BU standouts of the early 90s—and NHL stars—Keith Tkachuk and Tony Amonte. ►In addition to the 10 newcomers, goalie Max Prawdzic returns after taking off second semester to sharpen his game in the NAHL, where he led the Lone Star Brahmas to the Robertson Cup championship and earned playoff All-Star honors. After earning AHL Rookie of the Year honors with the San Jose Barracuda, former Terrier standout Danny O’Regan is competing for a spot on the Sharks. A second-team All-American and first-team Hockey East All-star as a senior, O’Regan, with 154 career points, was the first Terrier since 1998 to exceed 150 points.